If you search your ancestors in Racalmuto, Sicilia, info about your Italian family are stored in the City Office archives or at the parishes. In towns and villages of Sicilia and in Agrigento province registry offices were established around 1820: it means that you could find information in Racalmuto registrar as of that date. So, if your ancestors were in Racalmuto in the nineteenth or twentieth century, then you could try to contact the City Office of Racalmuto to know more. Before to start your genealogy research in Racalmuto, we suggest you to read our tips for your search . They are useful to search in sicilia and in Racalmuto too. 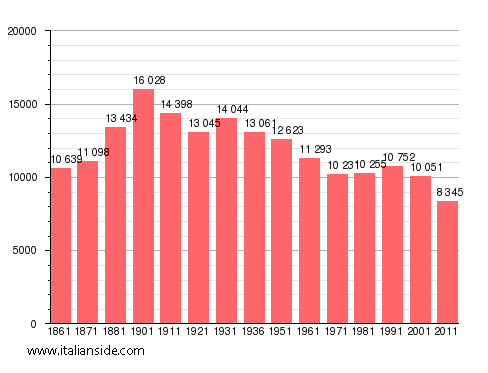 Next picture shows the demographic trends in Racalmuto from the Italian Unification (1861) an important info to understand how many people lived there in the past. It could be important to know if the last name you are investigating is a frequent surname in Racalmuto. As more your surname is common in Racalmuto, as more it could be difficult to find the right info about your ancestors in Racalmuto archives if you have not exact dates. Alaimo, Amato, Argento, Arnone, Bellavia, Bono, Burgio, Butera, Cacciatore, Carlino, Castronovo, Ciaccio, Cipolla, Colletti, Costanza, Cuffaro, Cusumano, Di Caro, Ferraro, Gallo, Gambino, Giardina, Greco, Iacono, Indelicato, La Porta, La Rocca, Lauricella, Licata, Lombardo, Mangione, Maniscalco, Marino, Messina, Miceli, Montalbano, Morreale, Mule’, Palumbo, Patti, Piazza, Rizzo, Russo, Sanfilippo, Tuttolomondo, Vaccaro, Vella, Volpe. Church archives in Agrigento province may instead contain even older information, but they are far less accessible from abroad (and almost impossible by email). Then,parishes send information not easily. If you have the opportunity to visit Racalmuto and Agrigento province, you could plan to investigate churches’ archives by yourself (or with us! ), but from abroad is very difficult to obtain any result unless you find a reliable local help. If you have the opportunity to visit Racalmuto and Agrigento province, you could plan to investigate churches’ archives by yourself, but from abroad is very difficult to obtain any result unless you find a reliable local help. For our experience is better to start to search months before your arrival: in this way you will avoid to waste time in the offices and with italian bureaucracy and you will have more free time to visit the town and surroundings on your ancestors footsteps. Another important source of information is the “Archivio di Stato” (National archive) in Palermo. In any case, never give up! Probably the distance from your country and Italy, some difficulties in understanding and in translation, could complicate your search but this should not discourage you. If your research is in a dead end and you need professional help from our local Italian genealogists write to racalmuto@italianside.com our expert in Racalmuto area will study your request and will reply to you with a research plan and a quote. I am Diana Partito my great grandfather on my fathers side was from Racalmuto. They came over from Palermo with their children but when the children were grown some returned to Racalmuto. I can’t find any Partito’s in that area. I’d love to know some history. I do know we are related to Russo and Embro. Thank you. I recently stopped off Racalmuto with my husband while on vacation in Sicily on the off chance of locating some family of my father-in-law, Thomas DeRosa, who is from there but was last there as a teenager. Unfortunately it was a holiday and the archives were closed. If anyone knows of any descendants Thomas’ father Gaetano De Rosa (spelling of De Rosa may be different) please let me know. My grandfather was Diego Morreale born 1886. His father was Salvatore Morreale (born ~ 1849)who married Vita Maria DiRosa in Racalmuto in 1883. Vita’s father was Diego DiRosa born ~ 1820 in Racalmuto. Diego was married to Palma Di Caro in 1861. Diego and Palma had at least 3 children: Vita Maria, Calogero (Charlie), and Giuseppe. My mother knew a Gaetano DiRosa. I hope this helps you Sandra. We may be cousins. I am looking for infomation about my relatives from Racalmuto. My grandfather’s name was Calugulo [sp?] Alfano and my grandmother’s name was Maria Giglia.They came to United States in the 19 teen’s and settled in Buffalo New York, where they got married. Hi I’m looking to connect with any relatives living in Sicily specifcally Racalmuto. My grandma’s name was Maria Licata Cino. She did move to Brooklyn ny but she passed when I was a baby in about 1956. I have been to Italy many times but have not been able to find relations living there.Thanks! Mary Ann, there are very many Cino’s living in Hamilton, migrated from Racalmuto. Many of these families are not related to one another. My great grand father s name was Antonio micale. He was married to Vincenzo Alfano. They had four children and all came from racalmuto. Could you help me to find information about us? I know they lived around 1900 there. I know they moved after the big earthquake in messine. Before you should have in your register maybe the date of marriage or the birth of their children. Hello, My Father came to USA as a child from Racalmuto with his parents and siblings. In Racalmuto our last name was Farrauto , but that got mistakenly changed to Farranto in Ellis Island. My dad was born in 1909 and they came to USA a few years later. My Fathers first name was Carmelo and I know that his mothers name (my Grandmother) was Philipina or something like that. That’s about what I know, Carmelo Farrauto, born in 1909, his Patron Saint was Madonna del Monte. Trace my ancestors. I appreciate all information. Your grandfather may be my grandfather’s brother & if so we have a wedding photo. My grandfather’s name was Leonardo Falco-Abramo. Trying to confirm that my paternal great-grandparents, Onofrio Giovanni Majorana and Catherina Caffarella (who settled in London, Ontario, where my grandmother, Laura Maiorana, was born according to Canadian census records), were originally from Racalmuto. Laura married Charles Rosart and they lived in Hamilton, Ontario, which seems to have been the destination of many families from Racalmuto. Would love to be able to trace the family back to its Italian origins for a possible “heritage trip” with my children. Any information appreciated. Thanks so much. Have you found out that your great grandfather Onofrio Maiorana was from the island of Lipari, off of Sicily? He is the brother of my great grandfather Bartolomeo Maiorana. I would be happy to share what information I have with you. I believe that your mother Laura passed away in 1999. When did your father Charles pass away? I do not have that info in my tree. I hope to hear from you. Thank you for your response. My family was Mattina and also Guarino . I heard they were from Racalmuto or something like that. My Grandmother Jeanette Guarino , louise and Isabelle (sisters) orphans for a while. My Grandfather was Joesph James Mattina. Hello! I am trying to locate my father’s relatives in Sicily. My grandfather, Antonio Sanfilippo, was born in 1890 or 1891 in Porticello, Palermo, Sicily. His parents were Nicola Sanfilippo and Eva Scardinia. My great grandfather, Nicola Sanfilippo, was born February 25, 1860 in Racalmuto, Agrigento, Sicily. His parents were Giacomo Sanfilippo and Maddalena Criscimanno of Racalmuto, Agrigento. I am searching for any information on my grandmother, great grandparents and other family located in Racalmuto. My grandmother, Angela Macaluso, was 4 when she traveled to New York with her mother Assunta Fuca Macaluso in September 1925. My great grandfather Calogero Macaluso was already in New York, about 2-3 years before. If anyone has any information on them or other Macaluso’s and Fuca please do share! My name is Giovanni ruggieri i am looking for my great great uncle carmelo ruggieri who immigrated to America, Ellis island from Sicily Racalmuto, Agrigento he was born on the 7.10.1876 he had several brother’s in sicily but he is the only one who went to America by boat. I have found a bit of information when he went to new york to ellis Island but i have come stuck since then if you or anybody out there know any information please contact me i would appreciate it very much indeed. My maiden name is Cino… My grandfather was Alfonso Cino, he married my grandmother who was a Campanella. They lived in NY before going to FL where she still resides. I believe we are second cousins. I am the grandson of Nick Cino who was the brother of your grandfather. Ran across your post just browsing through trying to do some research on the family. Cologero Marchese, father Giovanni and mother Rosalie (née Bartalotta) from Raculmuto….came to Buffalo, NY late 1800’s early 1900’s. Traveling there next September.,,any information is appreciated! Giovanni’s brother maybe Vincenzo who initially went to Hamilton Canada…want to know what ware they lived so I can visit. My family has never known much about my fathers side of the family. We have just discovered that my grandfather Edward Leone was born in Racalmuto on November 15, 1875. He was married to Phillipa DeVito and immmigrated to the US in 1906 from Palermo. We believe that they had 3 children born there and the whole family came to the US where they had 3 more children before Phillipa passed away in 1914. I would love to find out if I have any relatives there. My grandfather was a barber his whole life. Please contact me with any information. Their 3 children were named James, Angelina and Frances. My wife’s ancestors were from Racalmuto. Paternal grandparents Giuseppe Romano (b. about 1874) and Carmela Sardo (b. about 1885) Romano. I have seen their wedding certificate but couldn’t read it as it was in Italian. Maternal grandparents of my wife were Santo Lombardo (b. 1890) and Antoinetta Amoroso (b. 1900). Antoinetta’s mother’s name was Gaetana Imboli. Any further help you could provide would be very welcome. Ciao! My relatives were Angelo Scime (1868-1922) and Concetta Falletta-Caravasso (1883-1976). They were born in Racalmuto, and emmigrated to Buffalo New York in 1906. 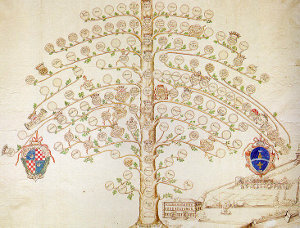 Their were descended from Ignazio and Addolorata Di Raimondo, Pasquale Scime and Nicoletta Sicurella. Other family names are Guagliano, Cino and Oliva. I would love any additional information if anyone has it. Hi, my surname is Cavaleri and I believe my father, Giuseppe and his brothers Angelo and Calogero migrated to Lancashire many decades ago. I am not in touch with them. All I know is I had a grandmother named Rosalia Anna who is buried there in Racalmuto. I was named after her. Are there still members of the Cavaleri family in that area? I am Kayleigh, granddaughter of Carmelo Cavaleri, Angelo and Your father Giuseppes brothers. I have been to visit Angelo this evening who showed me this as his friend had printed it out, however he does not own a computer and doesn’t understand how to respond himself. He remembers you as a baby. We all still live in Lancashire, around the Accrington and Darwen area, apart from my grandad Carmelo who lives in Canada and Maria their sister who lives in London. It would be great to hear from you and then I can pass your details on too. I am Kayleigh, granddaughter of Carmelo Cavaleri, Angelo and Your father Giuseppe’s brothers. It would be great to hear from you and then I can pass your details on. What a small world i know all the cavaleri family apart from maria Angelo sister who lives in London, my father carmelo ruggieri is angelo best friend who grew up together in sicily and eventually he came to england with my mum as we were my family born in england in blackburn apart from my younger brother who was born in naple’s which is were my mother is from. I remember your father many years ago. Didn’t realise he had another daughter, heard he had a son and is/was married to a lady called Dorothy who may be your mother. He had another daughter but not sure who she is. Such a lot of time has passed so may be wrong. Alfonso Pagliarello Puma (1926-2008) was a parish priest in Racalmuto, Sicily for 50 years. His brother was Salvatore Puma (1920-2007), an opera tenor who sang internationally. I would like to see either birth/death or obituaries listing the priest’s parents. I know that Salvatore’s parents were Calogero Puma and Maria Carmela Palermo because I have the birth record and passport. A Giglia person who met the priest said that the priest’s mother was a Morreale which contradicts my information. I would like to verify the true parents of the priest. It would be helpful to add the names of your husband’s parents and grandparents as far back as he knows them. That would yield a much better chance of finding relatives. I have traced my Puma ancestors down to a June 27, 1717 church marriage record for Giovanni Puma and Rosa Longo. Giovanni Puma’s parents on that record are Francesco Puma and Giovanna Pagliarello. For the women, the church records seem to include both the maiden and married names. I would like to obtain the church records for the marriage of Franceso Puma and Giovanna Pagliarello, which should yield their parents. In like manner, I would like to track down as many Puma parents and grandparents as exist. Less importantly, I see the combined Pagliarello Puma name often for individuals, though both are legitimate surnames of their own. I am curious as to how that started. Looking for info on Alphonso Giglia. Born in Racalmuto. I think you mean AlFonso Giglia. Where are you from? Do you have anymore information on this Alfonso Giglia. Date of Birth, siblings, etc. etc. I know an Alfonso Giglia that was born in Racalmuto. I am searching for my Racalmuto roots and family. My mother Santina Cino was born in New York in 1910 to immigrants from Racalmuto, Vincenzo Cino and Giovanna Alaimo. In Italy, they had sons Alphonse and Calogero. My father Calogero Curto was born in Racalmuto in 1905 to Vincenzo Curto and his wife whose name I think was Vincenza. They also had sons Gaetano, Salvatore, and daughter Maria. My father Calogero Curto left Racalmuto in 1922 and returned to visit in 1974. Most of Maria’s children and some of Gaetano’s children were still living there near Via Romolo. I don’t have any contact information for them. I would like to start my geneology search for my Cino and Curto family. Any help would be appreciated. Josephine, My great grandmother was your father’s sister. Vincenzo’s wife was Giuseppa. Also Victoria, when my daughter & father went to Racalmuto in 1974, his sister Maria had just passed away. They stayed with Maria’s son & his family and spent time with Maria’s daughters Vincenza and Maria Concetta every day. Was your great grandmother his sister Rose or Maria? And which of my cousins is your grandparent? So glad to hear from you. Thank you. Please remember that our local experts can t read all the messages posted on the website so they will not reply to these comments. If you would like to start a research in Racalmuto please send your request to racalmuto@italianside.com.